The Oakcliff All-American Offshore Team crossed the finish line in Plymouth Sound, England, at 12:19 AM last night. 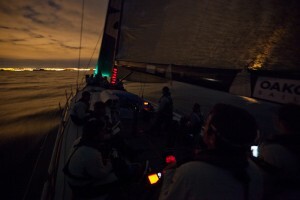 Our 2011 Rolex Fastnet Race took just over 59 hours. It was an excellent race for us from start to finish and it caps a tremendous season for the team, and one final achievement to be very proud of. It was not an easy race. We were tested in ways we haven’t been before, both physically and emotionally; diverting to RAMBLER 100’s last known position and wondering their condition took a heavy toll on all of us. Following their confirmed rescue, we then enjoyed some of the finest sailing conditions we’ve ever seen on the Vanquish. We (unfortunately) rounded Fastnet Rock in the dark, never seeing a thing, but the 25-30 knots of wind and prime surfing conditions made the ride back well worth the trip. The last eight hours to the race were difficult and tactically complex, navigating several coastal headlands in light winds and strong currents. We had a lot on the line (2nd place in class, 3rd place overall) with heavy pressure from boats pushing from behind, but in the end it looks like we’ll hang on to the 2nd in class, behind RAN (overall race winner), and 3rd overall–out of 277. That is a huge achievement for the Oakcliff All-American Offshore Team and something I doubt any of us will ever forget. After dropping one crewmember off on a rib we turned and started towards our home in Gosport, about 115 miles away. We’re currently crawling upwind at about 6 knots in 5 knots of wind, almost out of gas. We’re consequently looking at an arrival time sometime late tonight, 10:00, 11:00, 12:00, who knows. We’re not racing! Standby for final video upon arrival. Now that the Fastnet is over it’s time to look to the future. The OAAOT needs everyone’s help if it is to succeed. Support can come in any form, but our priority looking ahead is to continue training the next “class” of young American sailors. There are some exciting possibilities on the horizon like the Caribbean 600, Newport to Bermuda Race, and the Tour de France, and with a lot of help we can make those a reality.